The students of WHS and the students involved in the summer Whitehall Project received the Montana Youth Weed Fighting Group Of The Year award for 2002 from the Montana Weed Control Association (MWCA) at their annual convention in January of '03. Visit our Site Sponsors page for information on weed fighting companies and those who help sponsor the site. The site hosting is funded by these generous sponsors. Note: Because the WHS science classes do not update this site yearly any more, parts of this site are slowly becoming out of date. Still, many sections are very useful to those seeking knowledge about how to control noxious weeds. Also, the weed ID and biological control agents are more up-to-date. Todd Breitenfeldt, retired WHS science teacher, Whitehall Project Coord., site supervisor, June, 2016. Spurgia esulae gall on leafy spurge. 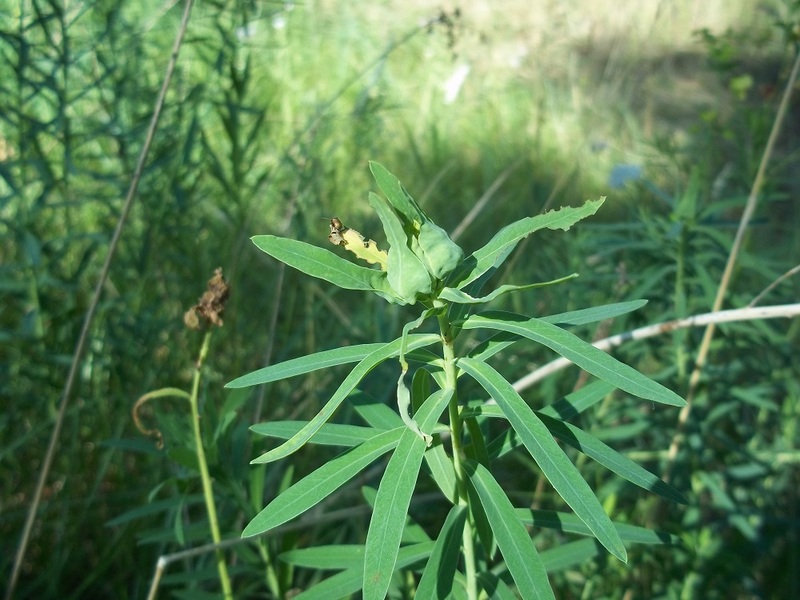 Also notice the leafy spurge flea beetle (Aphthona spp.) on a leaf and the flea beetle feeding damage to several leaves. Photo by Todd Breitenfeldt, July, 2013. This is a large .pdf file of this guide. This guide is available at most County Weed District offices. Note: this guide is being updated summer, 2016. 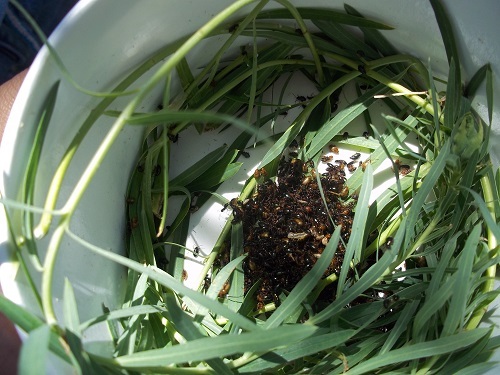 One thousand mixed leafy spurge flea beetles just collected, sorted and placed into an insect container with spurge foliage for transport. Photo by: Todd Breitenfeldt, July 2013. 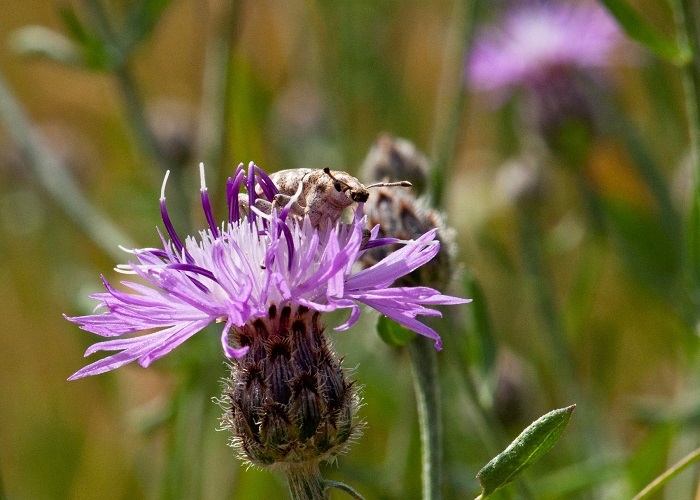 Cyphocleonus achates - the knapweed root boring weevil on a spotted knapweed flower. This is a newly released weevil that we collected and the land manager released on an infestation of the weed. Photo by: Grif Heath, 8-2013. 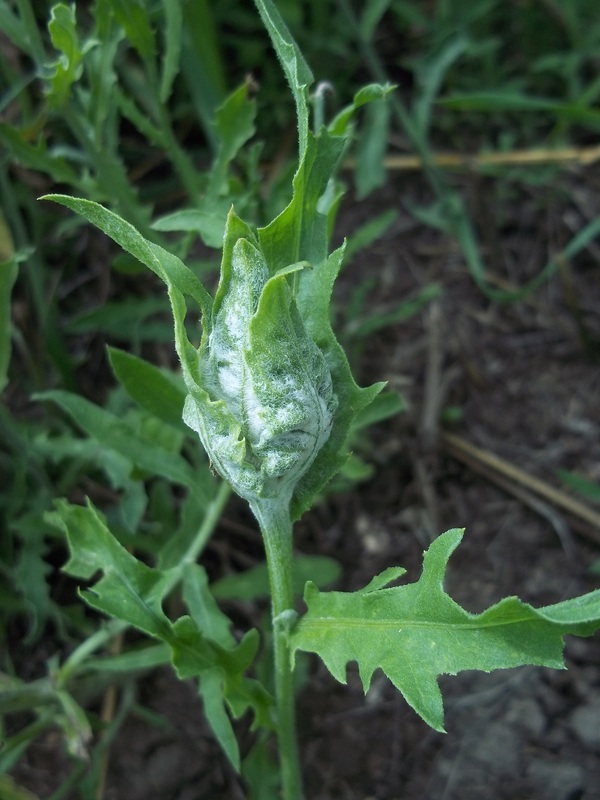 Jaapiella ivannikovi gall on Russian knapweed (Centaurea repens). These gall forming midges are a new biological control agent for Russian knapweed. We are now growing these in our insectary at Whitehall, MT. 6-18-13. We will have these available for release on very selective sites this summer. You must be able to mow or weed-eat the site 1-2 weeks before the release date to stimulate the production of new Russian knapweed shoots. This new shoot growth stimulates the midge larvae to emerge as adults, lay eggs in the new stems and form new galls. In Montana, contact: Todd Breitenfeldt 406-498-5236 for more information. Photo by: Todd Breitenfeldt, June, 2013. Some of the 2016 Whitehall Project crew collecting Oberea and leafy spurge flea beetles south of Whitehall, June, 2016. 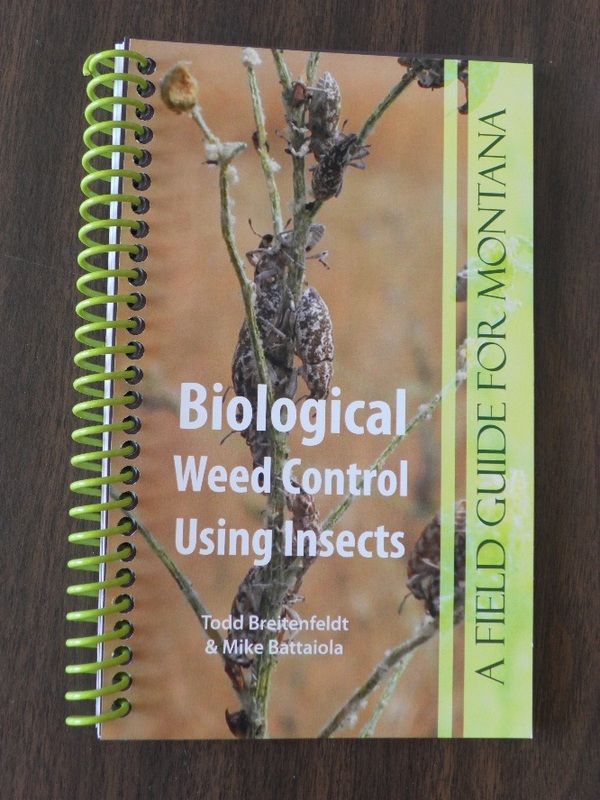 Montana Weed Control Assoc MT's Weed Awareness & Ed. Campaign Center For Invasive Plant Mgmt. Jefferson Valley Conservation Dist. Tour 10-99. 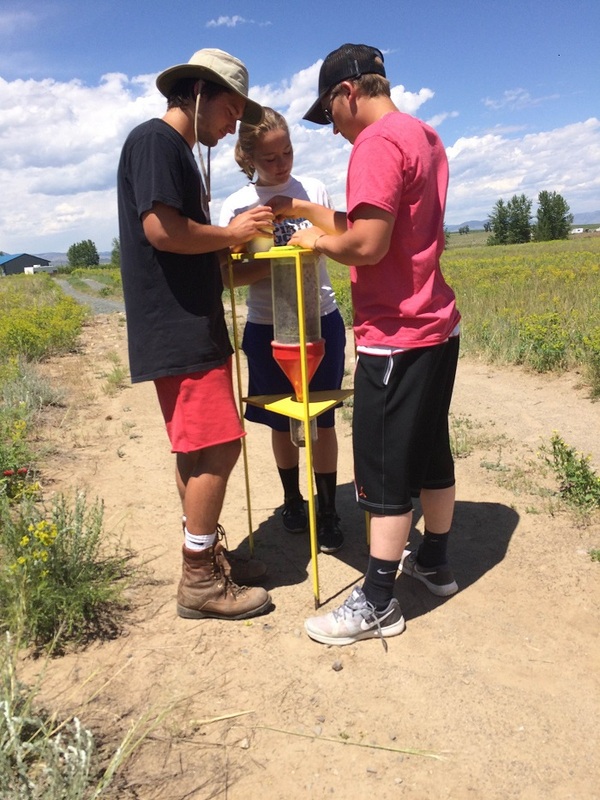 This site is being created, built and maintained by Whitehall High School students as an educational project, in cooperation with the Montana Noxious Weed Trust Fund, Montana Department of Agriculture, Whitehall Schools and the Madison and Jefferson County Weed Districts. The creation of this site is a continuing educational project, funded by Site Sponsors. This mtwow.org site is constantly being revised and added to by the students of Whitehall High School. The project is supervised by the WHS faculty, County Weed Districts, and the Montana State Department of Agriculture. As pages become active they will appear as links on your browser. If we have incorrectly credited a photo and/or have any errors or user unfriendly areas in this web site, please feel free to contact us! Suggestions and photo/info. contributions are always welcome!! Also, please feel free to use any photographs and information on this site. Just give the photographers, authors and this site the credit they deserve. Thank you! Site Supervisor: Todd Breitenfeldt, WHS Science Teacher/Whitehall Project. Contact Site Supervisor. P.O. Box 1109, Whitehall, MT 59759. Counter added April 7, 2003. As of May 5th, 2006 this site is averaging 38 hits per day.